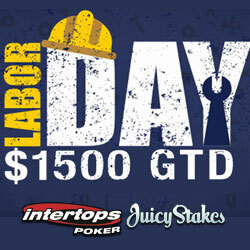 Intertops Poker and Juicy Stakes Casino are hosting a $1500 GTD Labor Day Poker Tournament on Monday, September 3rd. Players can buy in to the Final Table for just $20 or they can win their way to the Final in $2 satellite tournaments held every six hours, August 30th to September 2nd. Players can register for any satellite or the Final by clicking on the Tournaments tab in their poker software and then selecting the $1500 GTD Labor Day tournament from the list of daily poker tournaments. Further details are available at Intertops Poker (https://poker.intertops.eu/en/promo/391-labor-day-1-500-gtd) or Juicy Stakes Casino (https://www.juicystakes.eu/promotions/pkpromotions/labor-day-1-500-gtd ).